Our Funarena! 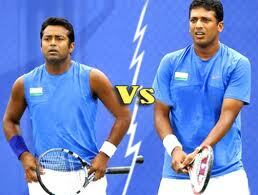 : The Biggest Tennis Fight: India Prepare For The Olympics Well! The Biggest Tennis Fight: India Prepare For The Olympics Well! The duo of A and B has been most productive for India winning three doubles Grand Slams over the years of togetherness. They had been the best of friends too and many described them as husband-wife preferring to remain silent on who was the better half! But A and B fought…and fought bitterly in 2002 splitting up and going separate ways. They continued to team up and not ‘pair’ up for major international tournaments though. Maybe reaching an understanding about who was the better half they patched up and played as a pair for the Australian open in 2011. But they fought again just before the London Olympics and fought the bitterest ever. B does not want to be paired with A at any cost as B lost faith in A irreparably. Both of them want C as a partner. Now C loathes A and wants only to be paired with B.
D—their father—pulled them up hard and stuck to what it thought the basic need of the hour. That A and B pair had been the best ever and the only real chance for Olympic honors. Coming under A’s pressure D wanted to consider pairing A and C, but C refused vehemently. Angry and confused, D asked them to think of the family first and personal issues later. The issue of sending two pairs from the same family never crossed distraught D’s mind! Bitterly disappointed, B approached the Godfather and pleaded him to mediate into the family feudalistic matters. The Godfather ordered D to seriously consider the option of sending two pairs or rather two teams as the costs were to be borne by him only, as always. The Godfather set a deadline so that the Olympics started on time in July! Bemused neighbors joined in the already-gaining-momentum chorus ‘Stop Fighting, Start Playing’! Dear readers, please put the values for A, B, C, D and the Godfather and get the full story. I have given you enough clues and links to get to that. Trust me; I do not doubt your intelligence. Like me you too must be looking forward to the London Olympics in July, 2012.
good luck to the both player in olympics. good luck to all the players! i wish them well! Good luck to the players for the Olympics. They are really that very good players. :-).